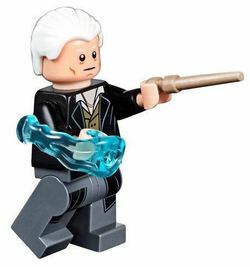 Gellert Grindelwald is a Harry Potter minifigure who first appeared in LEGO Harry Potter: Years 5-7. Grindelwald also appears in LEGO Dimensions in the story pack for Fantastic Beasts and Where to Find Them, albeit mostly in the disguise of Percival Graves. He will receive a physical figure in 2018. Gellert Grindelwald was a powerful Dark wizard trying to rise to power from the late 1920s to the late 1940s and conquer muggles. In the year 1926, Grindelwald impersonated Percival Graves, a high ranking Auror and right-hand man of President Seraphina Picquery of MACUSA, the United Sates' version of the Ministry of Magic. He used this postion to search for a powerful creature known as an Obsucrial, a magical person who had their magical abilities repressed and manifested itself as a dangerous weapon, whom he found in Credence Barebone and tried to recruit. This plan was ultimately discovered and thwarted by magizoologist Newt Scamander and disgraced Auror Tina Goldstein, and Grindelwald was promptly arrested, though he would "make a dramatic escape" a few months later. He was eventually beaten by Albus Dumbledore and locked inside his own prison. Lord Voldemort eventually comes to Gellert in his cell searching for the Elder Wand. Grindewald willing gave up that the recently deceased Dumbledore had won it from him, and Voldemort left. In the original release of the Fantastic Beasts story pack, Grindelwald appeared only as Percival Graves, to hide the plot twist of the film. After the film had been in theater for a couple of weeks, the ending updated to match the film. In the Fantastic Beasts series, Grindelwald is played by Johnny Depp, who also plays Captain Jack Sparrow in the Pirates of the Caribbean series. This page was last edited on 25 July 2018, at 19:33.